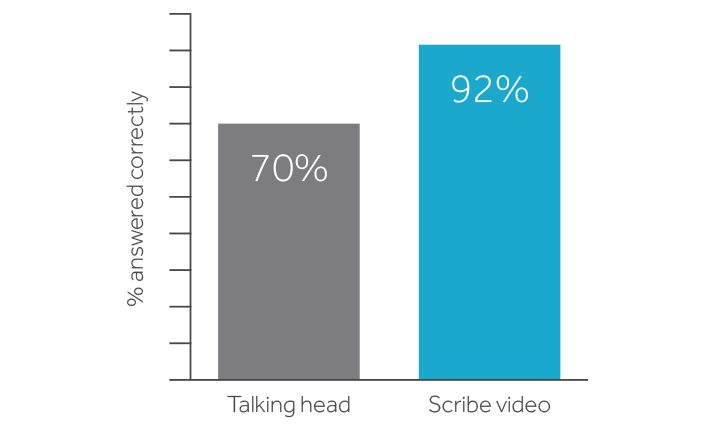 All the research shows that scribe videos improve learning. What do they do to the human brain that make them so effective? One leading psychologist thinks that he knows. Dr Richard Wiseman knows his stuff. He’s a scientific-award-winning professor of psychology whose research has been widely published. He often talks about psychology on the TV, radio programmes and in the papers. He’s written 10 books and amassed millions and millions of views on YouTube. He even discovered the world’s funniest joke. Seriously. Dr Wiseman is the kind of scientist who we’d love to ask about whiteboard videos. About why they outperform ordinary videos in memory tests, problem solving, shareability and overall impact. But we never will ask him. Because he’s done that research already. In 2012 Dr Wiseman took a video of himself talking and created a scribed version using exactly the same audio. He tested viewers’ memory after they watched one or the other, to see which one helped them learn the best. He was astounded by the results. Anyone involved in education or research will know that is absolutely massive. Normally you have to work incredibly hard to get 5, maybe 10 percent increase in any kind of behavioural measure like that. Simply by animation you’re seeing a 15 percent increase. One of the questions in Dr Wiseman’s research, 92% scribe viewers recalled the answer correctly – 22% more than those who had watched the ordinary video. This research closely matches our own A/B testing. What reasons does the scientist give to explain the ‘massive’ increase? ‘Simply because people are more engaged in the process,’ says Wiseman. We know that in order to remember something, you need to attend to it in the first place. If you haven’t got people’s attention, you’re not going to get the information in. I think what the animations do is hold that attention. They hold it in an incredibly engaging way. We’ve all been there. The bored faces might be colleagues, delegates, or students. The presentation might be a health and safety talk, a product demo, or a lecture on physics. But the question is the same – how can I win the attention of the people in front of me? How can I get my message across? Dr Wiseman has given us the answer – use whiteboard videos. They grab attention. They hold attention. They make sure that the information sinks in. The second reason Dr Wiseman gives is that scribe videos are fun. Can that really make a difference? You do anything better when you’re in a good mood … creativity, productivity, learning. … One thing [whiteboard animation] does is make me laugh, and it puts me in a good mood … Suddenly, it’s not so much work. It not only makes them have a better time, more importantly it means the information is just going in. Let’s face it – your students would rather be watching a video. Your colleagues would rather not sit through yet another Powerpoint presentation. Your website visitors are getting tired of reading all that text. If all whiteboard videos did was put people in a better mood – they would be worth it. But add the increase in information retention and memory – and you’ve got a winning combination. The brain is rewarded – pop! Whiteboard animation specialists TruScribe have done their own research into why the videos are so engaging. Scribes stimulate something called viewer anticipation. In the same way that a crowd gathers around a street artist to guess what is being drawn, watching the images in a scribe video emerge is exciting. As the hand draws out an image, ‘your brain is trying to anticipate what the final form is going to be,’ says Jonathan Surdo of TruScribe. When the final form is revealed the brain experiences SURPRISE and releases dopamine. *pop* Experiencing the unexpected increases the levels of dopamine in the brain, which is a pleasure chemical and in turn increases the engagement of the viewer. TruScribe discovered that the chemical response to viewer anticipation makes their whiteboard videos pleasing to watch gets the message across. Read more about this in the book Video Scribing. It certainly tallies with Dr Wiseman’s idea about how fun scribe videos are to watch – and explains why even the simplest scribe can mesmerise viewers. Getting and holding attention, putting people in a good mood and triggering pleasure chemicals through surprise – all of these help to account for the incredible performance boost that people get from watching scribes.